Shapes keep falling! Match the shapes to their corresponding box at the bottom of the screen to earn points and clear levels. Tap the buttons at the bottom of the screen to change their color. Match the color button with the color of the falling shapes to increase your score. Fail to match them and lose a life. Bonus items can make a surprise appearance. Tap the bonus item directly to gain their bonus -- either a health boost or a combo increase. Mysterious glowing versions of the shapes can appear. Fail to match them to the correct box below and something bad will happen. - 20 campaign levels: try to perfect all 20 levels. Can you collect all 60 stars? - Endless mode: See how long you can last. - Color blind assist: Adds the matching shape to each colored box. Customize the perfect game for your mood with over 8000 possible game variations. Either challenge yourself or go for a nice relaxing round. 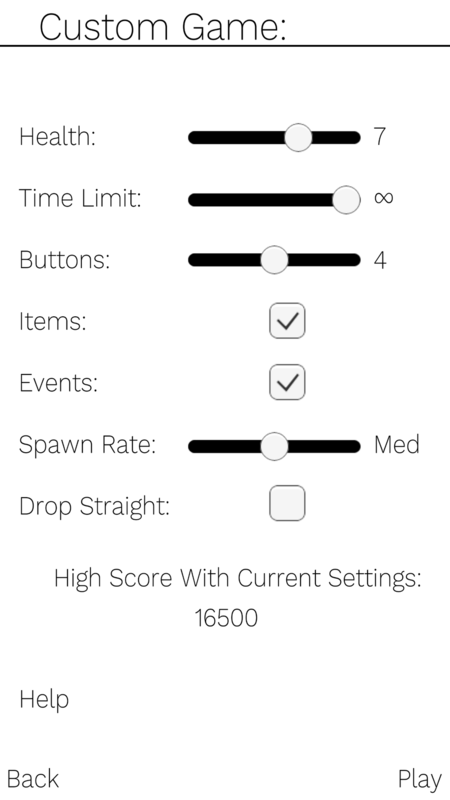 Track your high scores for each custom mode.